A contemporary leather briefcase. Ideal for those looking for a classic and refined briefcase to carry their laptop around on a daily basis. Knomo Foster Notebook Carrying Case 14" - BrownA contemporary leather briefcase. 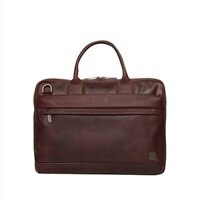 Ideal for those looking for a classic and refined briefcase to carry their laptop around on a daily basis.